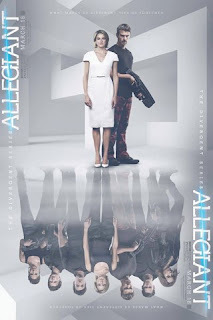 Allegiant is the first half of the final book in the Divergent series. If you are a diehard follower of this series as I am, you will remember that the final screen in the last book (Insurgent) was Tris looking out over the wall excited to be free from the confinement she had known her whole life. She was filled with hope that life would be better beyond the wall. Tris quickly realizes at the opening scene of this movie that the world has not changed. The leader of the Erudite Janine has now been killed by the factionless leader Evelyn. Evelyn has closed the wall and forbid anyone from leaving the city. The movie starts with Janine’s conspirators being held on trial. The punishment is death by gunshot. Tris quickly sees that leadership under Evelyn is no better than Janine and rescues her brother and flees the city with her boyfriend “Four”, friend Christina, brother Caleb, and traitor friend Peter. With Evelyn hot on their tails they make it over the wall. What they find on the other side is toxic wasteland made up of red sand and acid rain. They soon find that there is a large force field surrounding what is left of O’Hare airport. Within this bubble are the “pure” which they explain are the people that have perfect genetics. They are not part of the genetic war failures. The people outside of this bubble are labeled as “damaged” and have a life span of one to three decades. Tris and her crew find themselves welcomed into the “pure” city and Tris is brought to the Director David who is the so called president of the city. Tris quickly realizes that her home (Chicago) was an experiment to see if the world could heal itself from a genetic war. After realizing that her home was a “Truman Show” for lack of better words Tris fights back to escape back to her home. She gathers her group, minus Peter, and escapes the “pure” city. Peter however has hooked up with Director David and is sent back in to Chicago to destroy it. Director David plans to erase the memory of everyone in Chicago by using a gas on them. This will allow him to start over. The race is on for Tris to stop Peter and save the city. Allegiant is a very different movie than Divergent and Insurgent. A lot of the information we were given in the first two movies has been altered in the third which makes it hard to follow. I found myself at many points just giving up asking why they would change it. All in all, the movie was good, but as I said I am a diehard fan. If you have read the book series you know there is a huge surprise coming at the end of the series and I am curious how the final movie will handle it.